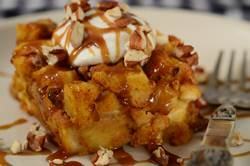 If you think the combination of bread pudding and pumpkin pie sounds delicious, then you will love this Pumpkin Bread Pudding. This dessert takes small chunks of bread and soaks them in a rich and spicy pumpkin flavored custard. And while this bread pudding is delicious on its own, to make it extra special, try serving it with a sweet caramel flavored toffee sauce. This is the perfect dessert to serve in cooler weather or when we just need a little cheering up. Of course, bread pudding is all about the bread, and the type and freshness of the bread you use will affect the taste and texture of the finished pudding. So remember that breads that are a day old and have a firm texture will keep their shape better than breads that are fresh or have a really soft texture. Also, leaving the crusts on the bread will make the bread pudding more chewy than if they are removed. Some good choices are a day old baguette, French, Italian, whole wheat, Broiche, Challah, Panettone, or you can even use Croissants. I like to cut the bread into bite sized chunks and I also like to add some chopped pecans to the bread pudding. You could use other types of nuts or even dried fruits like raisins, currants, dried cranberries or cherries, figs, prunes, or dates. You could even add some chunks of chopped apples or pears. Pumpkin Bread Pudding: Preheat oven to 350 degrees F (180 degrees C) and place rack in the center of the oven. You will need an 8 x 2 inch (20 x 5 cm) square baking pan. Custard: In an large bowl whisk together the eggs, pumpkin, cream and/or milk, melted butter, sugar, vanilla, spices, and salt. Add the bread cubes and pecans and toss to coat, making sure all the bread cubes are coated with the custard. Transfer the bread pudding to your pan and bake for about 25 minutes or until a toothpick inserted in the center just comes out clean. Remove the bread pudding from the oven and place on a wire rack to cool slightly. I like to serve the bread pudding warm with the Toffee Sauce. You could also serve it with a sprinkling of chopped pecans and a dollop of softly whipped cream or a small scoop of vanilla, cinnamon or pumpkin ice cream. Leftovers can be covered, stored in the refrigerator, and then reheated in the microwave. Toffee Sauce: Place the butter, sugar, and cream in a saucepan and bring to a boil, stirring occasionally. Let the mixture gently boil for about 2-3 minutes, stirring occasionally, then remove from heat and stir in the vanilla extract. You can make this sauce in advance and simply reheat.